In light of Catherine Middleton marrying her Prince Charming last week, all charms are on sale this week at Stamp and Create. The theme this week is Fairytale. 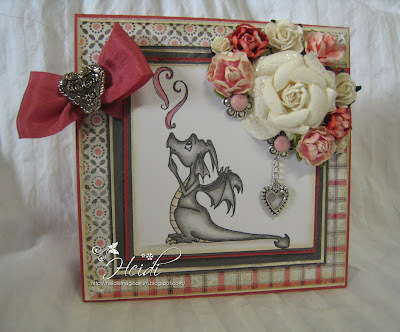 No Fairytale is complete without a dragon! Except this dragon is friendly and puffs clouds of hearts! I used Sweet November Cinder by C.C. Designs. The paper if Basic Grey Olivia. I also used May Arts Rose Ribbon, Manderin Prima-Cameo Roses, Basic Grey Nook and Pantry Brads, Flower Spacer 2, and a Heart 2 charm. So adorable Heidi. Super cute image and your arrangement of flowers in the corner are stunning. Aw!! Cute!! I just love your dragon with all the fab details. Your use of flowers and layout is beautiful!! Love your gorgeous, fabulous dragon Heidi. Hi Heidi, Gorgeous card and such an adorable image. Love the flowers and charm detail. How darling is this. That dragon just looks as if you want to hug him. Perhaps he is Puff the Magic Dragon rather than some damsel eating beast!